For anyone who is offering pressure washing service, it would be a good step not to miss condominiums as condo maintenance work exists almost everywhere. But how can you get condominium work? The answer is you need to learn how to write to property management companies or homeowners associations. You may begin targeting condominiums by sending a letter to as many homeowners associations and property management companies you can find. In your letter, introduce your company to the recipients then explain what you are offering and show how using power washers are the best preventive maintenance. You may fax fliers, visit some offices, drop off donuts with your business cards or start looking around for condominium complexes that you think may require cleaning. It is important to get your name in front of property managers as often as you can. When bidding for condo maintenance work, preparing a detailed proposal can definitely give you a job. It is important to let management companies know what they could get for their money, so start your proposal with a brief introduction of your company then describe what they should expect or how your company would do the condo maintenance work. With every proposal, it is a good idea to send a list of past projects, business licenses, references and insurance proof. But, please be aware that bidding on cleaning projects can be a little tricky as it can be a competitive market. You may not get everything you bid on but there is a lot of work that you can have. As with residents, a good proposal contract may come in handy as they usually list everything they are expecting to have like removing or protecting their decorations, personal property, pets and vehicles. Once you have obtained condo maintenance work, make sure to understand well what your client needs and what is not included in your service. In the contract, you may indicate that property on screened balconies will be protected from overspray or be removed. You may also state that the contractor, property management company and the HOA won't be held liable for water leaks caused by faulty or poor building materials. The very good thing about bidding for condo maintenance work is the fact that you are bidding on multiple buildings. If you receive a call to wash just one building, it will cost much more per building than if you wash a number of buildings on the same job. 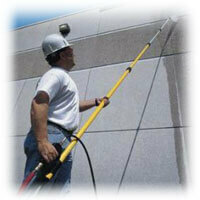 When it comes to doing the work, it could be an advantage if your crew knows how to perform exterior house cleaning. Most buildings and complexes have almost the same surfaces as homes that require cleaning: stucco, brick, painted wood, vinyl, hardboard and dryvit. Complexes and buildings are just bigger. Molds, dirt, mildew, spider webs and bird droppings are commonly cleaned off in these buildings.You can check out our pressure washer surface cleaners which are great for this kind of cleaning. Condo maintenance is almost the same with maintaining a home. So, if you are someone who wants to optimize your business, getting into condominium cleaning and maintenance can give you healthy profits. Pressure washer as a necessity for those in the restaurant business. 3 main types of insurance that you should know about.